Malta's first President, Sir Anthony Mamo died yesterday, eight months short of his 100th birthday. He was President between 1974 and 1976 after serving as the country's only Maltese Governor-General from 1971. Acknowledged as the world's oldest living former Head of State, Sir Anthony had joked during his last birthday that, although he knew he was old, he never realised he was that old. A state funeral will be held today. His corpse will lie in state at the entrance to the Palace in Valletta between 10 a.m. and 12.45 p.m.
Mass praesente cadavere led by Archbishop Paul Cremona will be said at St John's Co-Cathedral in Valletta at 2 p.m. followed by a funeral cortege to City Gate, through Republic Street. The funeral will then continue privately. Tributes to Sir Anthony flowed in soon after his death was announced. President Eddie Fenech Adami said his first contact with Sir Anthony was at the University, where he lectured criminal law. "He was one of the most outstanding professors at the University. He came for lectures extremely prepared and, by his own admission, he spent hours on preparation in spite of having been a criminal law professor for a very long time. "But I got to know him better in his official positions, first as president of the courts, where I appeared before him as a lawyer several times. "He was extremely intelligent, he knew the law inside out and it was remarkable how he used to follow the proceedings with great attention and seriousness. "As Governor General, he played a primary role in the constitutional discussions for the country to be transformed from a monarchy to a republic. "I was present for all meetings held between the two sides of the House and it was his soave, constantly balanced judgment that helped an agreement to be reached for the 1974 constitutional amendments." Dr Fenech Adami said that, as President, Sir Anthony was exemplary, careful about protocol and in his behaviour he was most affable and humble at all times in spite of his wisdom. He served the country with great integrity, assiduously, honestly and intelligently. Chief Justice Vincent DeGaetano said Sir Anthony was a great man in a quiet, humble and unassuming way. "God's greatest gift to him, which he retained almost to the very end of his life, was his clarity of thought, which comes out so well in his judgments and his University lectures, many of which are still preserved in the form of notes and still in use even by legal practitioners." Sir Anthony served his country loyally and always with the dignity of the office he held - as Crown Counsel, Crown Advocate General, Chief Justice, Governor General and, finally, as President, he said. "Those who met him, as I had the fortune to do, in his retirement could not but be impressed with his serenity. "Even in his old age he was always interested in what was going on in the courts and would enquire about this or that judge or lawyer. "The last time I met him was two days before his last birthday in January. He was overjoyed that I had brought him a plaque engraved with the unofficial logo of the judiciary and which contained an inscription that in the late 1960s, at the suggestion of Vincent Depasquale, he had contemplated having engraved in some part of the stonework of the court building - iustum iudicium iudicate - make righteous judgment. He was an inspiration to generations of lawyers, magistrates and judges," the Chief Justice said. Prime Minister Lawrence Gonzi paid a "heartfelt" tribute to Sir Anthony whom he described as a "national figure" and a person who left his mark and made a difference in the country's constitutional and legal sphere. Sir Anthony was also a man who reflected the country's values. Like President Fenech Adami, President Emeritus Guido de Marco also knew Sir Anthony since his University days. "He was my professor of criminal law and has been my role model ever since. As professor of criminal law, I have followed in his footsteps trying to impart to my students at the University the knowledge and the love of criminal law which were instilled in me by him," he said. As Chief Justice and president of the Court of Appeal, Sir Anthony was a mirror of integrity and correctness towards all those appearing in court. "His style of presiding over the court was elegant and wise and he made of the Court of Appeal a model of behaviour and of erudition," he said. Prof. de Marco said Sir Anthony made his role of Head of State a symbol of unity, at the same time giving the Presidency a moral authority. Sir Anthony's efforts had led the two political parties to embark on discussions which eventually led to Parliament approving by a great majority the change into a republican state, Prof. de Marco recalled. Malta owed a lot to Sir Anthony and he set very high standards for whoever occupies the Presidential role. "Thank you Sir Anthony. We will all miss you. Your legacy will remain with us," Prof. de Marco said. Ombudsman Joseph Said Pullicino, a former Chief Justice, said Sir Anthony will be remembered above all as a person and gentleman who served his country well. "He lived up to the Christian values he professed and cherished. He will for long be a shining example to the civil servant for his loyalty and integrity, to the judiciary and legal profession for his contribution to the jurisprudence, to the politician for being a beacon of national unity in a difficult time and to the people at large for his unassuming but dignified manners, his humility and love for his country. "His place in Malta's history is assured; he shall be sorely missed." The Nationalist Party and the Labour Party expressed sorrow at Sir Anthony's demise, extending condolences to his family. The MLP said that in Sir Anthony's own words, the day when he became President had been the best of his life. The PN said Sir Anthony was loyal to Malta and did his utmost to serve the country. 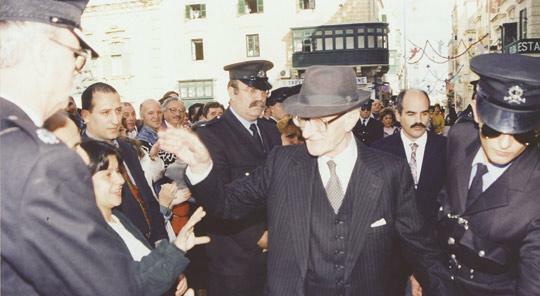 The two parties pointed out that Sir Anthony served under four Prime Ministers from both sides of the House - Sir Paul Boffa, Nerik Mizzi, George Borg Olivier and Dom Mintoff. The public has been asked to fly flags at half mast. Because of the funeral, public transport between 2 and 4.30 p.m. today will leave from St Anne Street in Floriana. Sir Anthony will be buried at the Addolorata Cemetery tomorrow following a service at St Helen's Basilica, Birkirkara, at 10 a.m.
A resident of Casa Arkati in Mosta for the past 12 years, Sir Anthony was born in Birkirkara and educated at the Archbishop's seminary and the University of Malta where he graduated BA in 1931 and as a doctor of laws in 1934. He was in private practice for a year before joining the Civil Service. He served as Crown Counsel from 1942 and became Attorney General. He was appointed Chief Justice in 1957 and Governor General in 1971 before becoming President in 1974. Sir Anthony was awarded the OBE in 1955 and knighted two years later. He was made Sieħeb il-Ġieħ within the National Order of Merit in 1992.